The advancement of information and communication technology directly influences the life style of human being by making their life easier, sophisticated in many circumstances. The healthcare sensor network is one of the emerging areas of research for both computer science and health professionals. The Quality of Service (QoS) requirement of the traffic in emergency situation is one of the key challenges in this network. The Medium Access Control (MAC) layer plays vital role for reliable and on time delivery in the healthcare sensor networks. The healthcare system provides remote monitoring, real-time identification and control information which helps in identifying the unusual patterns and making more precise information about the situation. 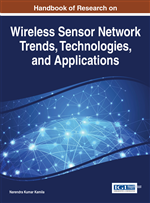 In this chapter, we present the issues and challenges of supporting sensor networks for healthcare applications. Then we present an extensive survey of MAC protocols developed to address the major challenges and improve the capacity of healthcare system in WSN. The recent technological advances in biosensors, low power integrated circuits and wireless communication have enabled the design of low cost, light weight and intelligent physiological sensor nodes. These nodes are capable of sensing, processing and communicating one or more vital signs seamlessly integrated into wireless personal or body area networks for health monitoring. The healthcare sensor networks continue to play a significant role in the future of the modern healthcare system. The patient’s body signs (e.g temperature, heart rate, blood pressure, oxygen saturation etc) are continuously monitored by the biosensors mounted inside and outside the body of the patient’s forming a wireless body area sensor networks (WBASN).These sensors transmit their readings on a timely fashion to some isolated location. These readings are interpreted by the doctors or the physicians to evaluate the patients’ condition. The WBASN can be assimilated within wireless local area network (WLAN) to enable remote monitoring for various environments (Yuce, 2010). However, a number of ongoing research efforts have focused on healthcare system where a number of patients can be observed remotely. This technology has enhanced the flexibility and capability of providing reliable data. The Information from various parts of the body is transmitted to the base station (BS) by the sender node (Yoo, 2010). However, many practical difficulties still essential to be overcome in order to have secure, reliable, power efficient and flexible WBASN which is very crucial for minimum personal monitoring (Gonzalez-Valenzuela, 2011) and improved the patients quality life. In emergency situations, the patients are able to avail all the medical facilities in more convenient and independent ways without need of special caregivers. This system also provides the real time identification and action taking in pervasive healthcare system. This monitoring system also provides context information which helps to identifying unusual patterns and making more precise information about the situation. The Wireless Body Area Sensor Networks (WBASN) can be applied to provide healthcare and patient monitoring. However, patient privacy can be vulnerable in a WBASN unless security is considered. Access to authorized users for the correct information and resource for different services can be provided with the help of efficient user access control mechanism. Recently the use of WBASN has been increasing rapidly in medical healthcare application. The WBASNs are emerging as important networks applicable on various fields.